Enjoy all that Park City has to offer from this beautiful Crescent Ridge multi-level vacation home! This is the ideal place to spend quality time with family and friends. 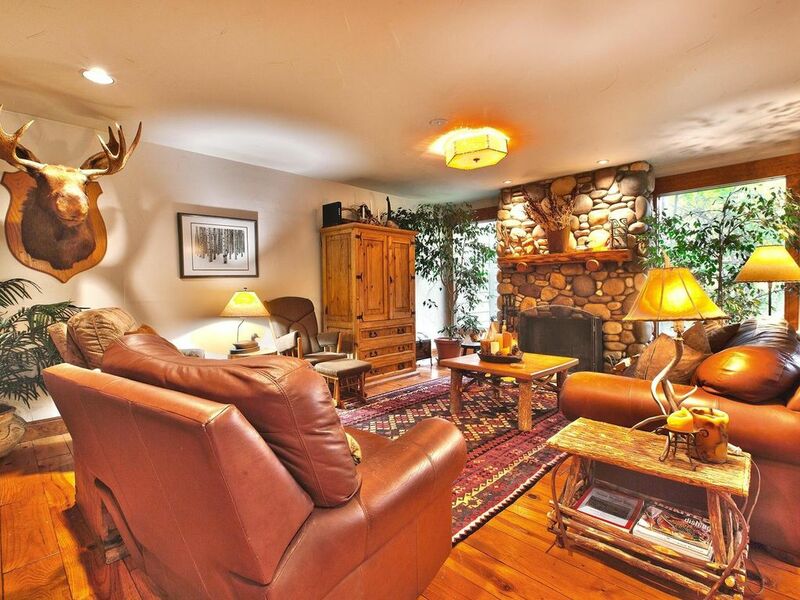 The modern mountain lodge decor includes a fully appointed gourmet kitchen, whirlpool master bath, a huge wood-burning fireplace, and a genuine mounted moose head! It sleeps 7 comfortably in the 3 bedrooms, and each bedroom has its own bathroom and TV. The upstairs master bedroom and downstairs bedroom both have comfy king beds and large closets, and the “kids room” has a double bed and a twin. A twin AeroBed is also available for guest use. This condo is steps from the slopes in 2 directions. Walk to the right about 200 yards to the Silver Star Resort to easily buy a lift ticket, rent ski/snowboard equipment and hop on the Silver Star Chair Lift in minutes. Walk to the left to the end of Crescent Road to ski down to Park City Mountain Resort's Base Area. The living room has a Sony High Definition Smart TV, a DVD player, Bose Stereo and a full collection of board games to enjoy (e.g. Monopoly, Sorry, Pictionary, Scattergories, and more). A fast WiFi internet connection works throughout the house. There is always a plentiful supply of free firewood for warm, cozy evenings by the hearth. Guests with an infant are welcome to use the Pack-n-Play, bouncer, booster seat with tray, and umbrella stroller. There is a ski/snowboard storage room as well as snowshoes and a variety of sleds and snow boogie boards available for guest use. Guests can also use the washing machine and dryer in the separate laundry room. This condo is a corner unit, so it is private and serene, surrounded by aspens. Enjoy watching the birdlife and deer from the huge windows in the dining room. In fall and summer, sit on the balcony off the master bedroom, or BBQ on the gas grill located on the spacious downstairs deck. Stock up easily at the nearby grocery store and the Utah State Liquor Store less than 5 minutes away. Catch the bus at the foot of Crescent Road to ride Park City's free public transit system to Main Street shopping, restaurants, and nightlife. The bus also stops at Deer Valley and Canyons Village ski resorts. Just a five-minute walk away is the Park City Golf Course. In the winter it's perfect for cross-country skiing and snowshoeing. Also nearby are great hiking and mountain biking trails. The owner has provided a binder full of tourist information and brochures for fun activities to explore during your stay. It's hard to find a better place that combines privacy with proximity to the best Park City has to offer! Book your vacation today! My name is Amy Folsom Teeling, and I am the owners' daughter and the property manager. I live in the San Francisco Bay Area with my husband and 2 children. After growing up in Florida, I learned how to ski while in college in New England. My parents bought this Park City vacation home in 2000 as a place where our family and friends could meet up and spend time together. Over the years, I've enjoyed many wonderful vacations here with my own family, my twin sister's family, my parents and girlfriends. Now, we're ready to share our home-away-from-home with you! We chose to buy a vacation home in beautiful Park City because it has world class skiing, along with great restaurants and nightlife and a picturesque Main Street. Best of all, it's only 40 minutes from the Salt Lake International Airport. We loved the coziness of this condo, its ideal location, and the floor to ceiling wood burning fireplace. * The real wood burning fireplace (with free wood!) is a unique asset in rental properties. * So is the real moose head hanging in the living room! * Location, location, location! * Minutes from Main Street restaurants and nightlife but secluded and private. Shampoo/conditioner, shower gel, hand soap and hairdryers provided in every bathroom. Feel free to do laundry during your stay. Detergent provided. Laundry room is shared with Unit 134 but each unit has own washing machine & dryer. Many basics are stocked, like spices/seasonings, oils, cooking spray, flour, sugar, etc. Plenty of dishes, bowls, coffee cups, wine glasses, etc. Dining table has 6 chairs. There are 2 chairs at the kitchen island. Flat screen TVs with cable in each of the 3 bedrooms. High Definition Smart TV (with cable, internet, Netflix & music channels) in the living room and one of the bedrooms. Bose CD player and radio in living room (you can plug in your phone and to listen to your own music collection). Portable Bluetooth speaker also available for use with your phone/tablet/computer. There are a variety of novels in the bookcase in the kids room bedroom. Many board games for all ages available: Scattegories, Sorry, cribbage, cards, Pictionary, Uno, Yahtzee, Trivial Pursuit, Cards Against Humanity, puzzles, etc. There are some toys and books for toddlers in the middle drawer of the living room armoire. There are a variety of DVD movies and TV series available for your viewing pleasure. You are minutes from the slopes! We have a membership to use the heated pool at the nearby Three Kings Condos Community Center (just a very short drive or a 10 minute walk). You can also use the community hot tub at Three Kings, which is huge! Relax and unwind in winter or summer. We provide the following: linens, bedding, extra blankets, towels, kitchen supplies, iron, ironing board. Great place to stay. Charming and cozy. Easy ski in/out location with 5 minute walk to lift and ski rental shop. Near town and great restaurants and night life. Over the top and amazing!!! One of our favorite places to stay!! Clean, spacious and well stocked! Would rent it again! Amy was amazing to work with...very personable! Clean, great layout and cozy! I loved working with Amy, she was helpful and kind. Her house is wonderful with plenty of room and located very close to Main Street! Great host for this property and great location with duel access to slopes/lifts. Property has lots of character and well furnished with everything you need to make your ski vacation comfortable. Everything is well labeled and the place is well stocked with paper products and toiletries. Host is very responsive and easy to contact for any questions that arise during your stay. Condo location is at the base and very close to Park City restaurants, grocery stores, and two ski lifts (Silver Star & First Time) Very enjoyable stay. My family had a fabulous time staying at the beautiful, and very comfortable well equipped 3 bedroom and 3 1/2 bath condo. The kitchen was fully stocked, there were TV's in all the rooms (with cable) and all the beds were comfortable with soft cozy blankets. The owner Amy was great, super nice and willing to make suggestions and answer any questions before and during the trip. The condo had a notebook with all extensive details about the area with suggestions for things to do. The maintenance company owner Rina was fabulous attending quickly to any minor needs we had and super friendly giving a variety of suggestions for anything including restaurants and rentals etc. It's a good idea to have a car to get around. Uber was easy to access as a good option. This would be great in the summer or winter! Park City Mountain Resort is now the largest ski resort in the country with 7,300 acres of skiable terrain. (In 2015, the 8-passenger Quicksilver Gondola opened, connecting Park City Mountain Resort and The Canyons.) From powder filled bowls, to top-to-bottom intermediate trails to gentle, groomed beginner runs, Park City has world-class terrain for every member of your family to enjoy. Click on the Plus sign on the map a few times to zoom in and see this condo's excellent location! This condo is steps from the slopes in 2 directions. Walk to the right (100 yards) to the Silver Star Resort to easily buy a lift ticket, rent ski/snowboard equipment and hop on the Silver Star Chair Lift in minutes. Walk to the left to the end of Crescent Road to ski to the Park City Mountain Resort base area.